1993 Fadal VMC4020HT 4-Axis CNC Vertical Machining Center s/n 9311101 w/ Fadal CNC88HS Controls, 21-Station ATC, CAT-40 Taper Spindle, Rigid Tapping, High Speed CPU, Graphics, Coolant. ATC, CAT-40 Taper Spindle, 10,000 RPM, Spindle Orientation, Spindle Orientation, Assist Software, Coolant. 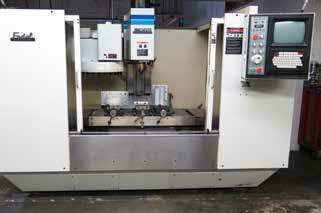 Hydraulic Tailstock, 8” 3-Jaw Power Chuck, 5C Collet Nose, Chip Conveyor, Coolant. Bridgeport Series 1 – 2Hp Vertical Mill s/n 247862 w/ Acu-Rite III DRO, 2Hp Motor, 60-4200 Dial Change RPM, Chrome Ways, Power Feed, 9” x 42” Table. Bridgeport Series 1 – 2Hp Vertical Mill s/n 241068 w/ Acu-Rite III DRO, 2Hp Motor, 60-4200 Dial Change RPM, Chrome Ways, Power Feed, 9” x 48” Table. Standard Modern mdl. 13-40 13” x 40” Geared Head Gap Bed Lathe s/n 9697 w/ Acu-Rite Quikcount II DRO, 40-2000 RPM, Inch Threading, Tailstock, 8” 3-Jaw Chuck, 5C Collet Closer, Coolant. Harig mdl 612 6” x 12” Surface Grinder w/ Walker Fine-Line Electromagnetic Chuck. Kaeser Sigma Profile SM6 5Hp Rotary Air Compressor s/n 06850 w/ 21 CFM @ 110 PSIG. Rutland 10” Horizontal Band Saw s/n 71032. Fly Eagle Pedestal Carbide Tool Grinder. Enco 6” Belt / 12” Disc Sander. DBM mdl. 32 Vibra-Burr Media Tumbler. Brown & Sharp CMM Machine s/n 0696-1610 w/ 18” x 24” x 16” Work Envelope, Renishaw MIP Probe Head, 22” x 29 ½” x 3” Granite Table, DEA / Maestro Windows Based Software. Fadal mdl. VH5C 4th axis 5C Rotary Head. Huot Toolscoot Taper Tooling Cart. Harig/AB 5C Spin-Indexer Grinding Fixture. Insert Turning, Boring and Milling Tooling.